At the start of the 1997 season, VBA was moved (again) to a renovated building located at the Keefer Terminal complex, in the Thunder Bay Intercity area. Along with the new location, the former Coast Guard Radio Station (CGRS) became a Marine Communications and Traffic Services (MCTS) Centre. 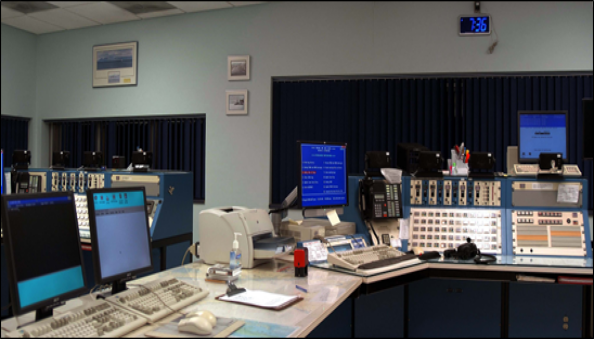 The separate, but often overlapping jobs of CGRS and Vessel Traffic Services (VTS) were amalgamated with all staff cross-trained over the next few years at the Coast Guard College (Sydney, NS), and as a result, the number of separate radio and traffic stations was reduced from 44 to 22! We were also now under the control of the Department of Fisheries and Oceans (DFO), but a few years later we became a Special Operating Agency (SAO) within DFO. The VBB Sault Ste. Marie and VBC Wiarton stations were closed, and a communications console from each was re-installed at the new Thunder Bay MCTS Centre. These early 1980's consoles, by 1997, were getting long in the tooth, and their old computer chips (Z80's) were really pressed when asked to do even more! 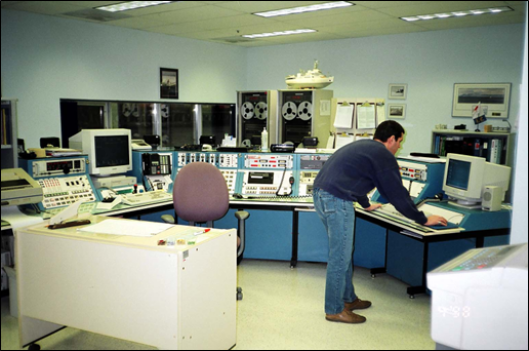 The old analog data landlines were replaced with digital ones in order to combine all of our remote controlled sites (eventually 15) into the new "super" Centre. (background) would be replaced with a computer voice recording system called COMLOG. The new operations room was less cluttered and more spacious compared to the old one at the Post Office! To say the first season of the new Thunder Bay MCTS Centre was interesting is an understatement, with a radio area covering Lakes Winnipeg, Superior, northern Huron, plus Georgian Bay and western Hudson Bay! Our new computerized geographical database (created by the staff) had over 6,000 entries, so learning the "lay of the land" was a daunting task and it would take about 2 to 3 seasons for most of us to feel comfortable with all the new geography and mariners. Three separate stations, their staff and equipment were thrown in together, and had to make it work right from the first day of the shipping season! Retired staff at the old stations acted as standby radio guards, usually sitting on apple crates, in gutted operations rooms, waited for the change-overs to either go as planned or come apart at the seams! Luckily, when they threw the switches, it all worked! In a “good” season, we average around 400 calls for assistance (of varying degrees), mostly from Georgian Bay pleasure boaters. Because of this, VBC Wiarton had VHF DF (Direction Finding) equipment transferred to VBA, and it became very handy in helping to learn the geography of Georgian Bay. A few years later, electronic charting computers running Regulus were added at each position so now we didn't have to get up and run over to the charting table to use the paper nautical charts and manually plot positions, and this reliance on computer technology was rapidly changing the way everyone worked and did business. radar, or any other way to track ships in the port, so we carried over the system already in use; a very large paper logging sheet recorded vessel arrivals/departures/shifts to elevators/docks using coloured paper clips and two-way voice radio communications! The year 2000 had us dealing with the so-called “Millennium (Y2K) Bug” which was supposed to wreak havoc on world-wide computerized systems. For us in northwestern Ontario, the prospect of sitting in the cold and dark out at one of our remote sites, on New Years Eve, wasn't a very appealing prospect. But we were trained on the backup radio equipment installed at the remote sites, and learned how to use “portable” satellite phone systems. You had to flip the top of a small attaché case open, and align it to the satellite’s altitude and bearing to make a call. But, it was much ado about nothing and 1 January 2000 came and went without a problem. In the new century, cell phones and handheld GPS units became more common with boaters. The result was most commercial ships and pleasurecraft no longer needed us to send/receive radio messages and phone calls, and we dropped those two commercial services but still provided emergency and medical phone patches. Because of electronic charts and GPS we could plot mariners positions and provide faster assistance when they needed help. Digital Selective Calling (DSC) equipment was installed in 2007 for use at our Great Lakes sites, and new marine VHF radios came with built-in DSC electronic messaging using AFSK (audio frequency shift keying) 1200 Baud (bps) packet radio on VHF marine channel 70. 1980's versions! A KVM (Keyboard Video Mouse) switch allows up to 4 computers to share a monitor! Future plans for the MCTS Centres are for touch-screen computers to digitally control all communications, controls, and key functions. The maritime Automated Identification System (AIS) is being installed at MCTS Centres and more consolidation of existing MCTS Centres is planned as the technology advances and improves. Less operators are required to provide services to even more mariners over larger geographical areas (at least, in theory). I retired in the spring of 2012 and won't be around to "play" with all the new "toys". 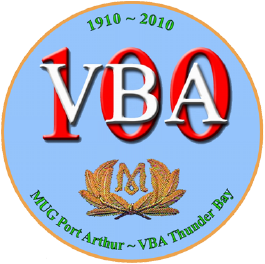 VBA is scheduled for closure because of MCTS consolidation so VBE Sarnia will be the only Canadian Great Lakes station remaining from the original 1912 chain of Great Lakes marine radio stations! Raytheon Canada VHF-DF system (left) and SECMAT DSC system (right) between consoles 1 & 2. "Fraud is the ready minister of injustice." Personal web site. Not affiliated with any agency. Copyright © 2000-2019 R. C. Mazur, VA3ROM.